If you are looking for more biscotti recipes then you have come to the right place. There are an endless number of combinations of ingredients that can be used to make biscotti. I actually own all of these biscotti cook books, and more. If you are looking to increase the number of recipes in your collection, then read on. "Biscotti" is the first cookbook that I bought after my love for Biscotti took root. This book taught me how to bake my own biscotti and provided me wtih 26 recipes to enjoy. The book covers the basics of making Biscotti and provides some great tips from measuring ingredients accurately to storing Biscotti so that it stays fresh and crisp. The book is divided into four chapters, to guide the reader through several varieties of the crunchy delight. Starting with traditional recipes like Biscotti Di Prato, and Biscotti all' Anice, which are typically served with Vin Santo (sweet Italian wine). The author moves on to chocolate and nut varieties that go best with an espresso or cappuccino. The recipe collection finishes up with some regional variations and healthy options. Yes biscotti can be healthy, as many recipes do not call for any fat other than the eggs. All in all, it is a charming little cookbook with several very good recipes. It doesn’t cover the process of making and baking biscotti, but does have some great tips and helpful insight into these Italian delights. The Biscotti recipes in this book are mostly low fat. They seem to be original developments the author modeled after the recipe for Biscotti de Prato which it a traditional low fat recipe. She goes on to say that these recipes for biscotti are for grown-ups, to be savored with a glass of wine, a steaming mug of cappuccino, or a relaxing cup of tea. They are not the super sweet treats that our children would enjoy. Because they are low fat they are relatively low in calories (about 45 calories per biscotto) making them ideal small indulgence. Most of the recipes are pretty easy to make and will taste much better than overpriced commercial versions. In addition, to Biscotti, there are recipes for delicious meringue cookies, which have no fat and even fewer calories (15 to 20 calories per cookie) and a handful of other low-fat cookies. There are no artificial ingredients in these recipes—no fake fat and no prune butter substitutes for chocolate. All the recipes are made with traditional high quality ingredients and fit perfectly into today’s” Light” way of eating. In addition to 45 recipes for Biscotti (39 sweet and 6 Savory) there is 7 meringue recipes and 4 low fat cookie recipes. There is also chapters covering Ingredients, Equipment, Procedures and Tips for Baking Great Biscotti. The chapter on Ingredients explains the need for using best ingredients when you are cutting the fat from a recipe, because fat does add flavor. You will always get the best flavor from fresh, pure ingredients. Topics range from flour selection to how to choose the best nuts and chocolates for baking. The Equipment chapter provides information on what to have on hand to make you baking go smoother. The author also likes to use and recommends an electric stand mixer to make the whole process easier. Most of the recipes in the book call for the use of a heavy duty stand mixer, but there is a reference page that gives instructions on how to mix without power equipment. The chapter on Procedures covers, toasting nuts and melting chocolate. Toasting nuts brings out the flavor to the nut and makes a big improvement in flavor. Melting chocolate requires more than just throwing it in a pan and turning up the heat and the process is covered nicely in this chapter. Tips for Baking Biscotti, the last non-recipe chapter, offers up an array of tips that will make baking biscotti much easier and ensure that you end up with great results. All in all this is a very good book on biscotti baking. There is not much in the way of photographs (like none) and few illustrations. But if you are looking for I nice collection of low fat, biscotti and cookies it would be a good addition to you collection. From this book you can learn to bake Biscotti that is just a delectable as those sold at the finest family owned bakeries. From Basic Biscotti to biscotti spiced with ginger or spiked with citrus, the recipes are easy, and result, crisp and extrodidare. One particularly interesting recipe is "Red Wine Biscotti". I would think that these biscuits would be particularly good dip in a glass of good wine. I can't wait to try it. Once tested and converted to my recipe standards I will most likely post a similar version here and Everything Biscotti. This book does not have any photos, images or illustrations, so if you like your cookbook filled with color, this book might not cut if for you. But, if you are just looking for some great Recipes for Biscotti this book has 15 in all, including Mandelbread or Mandelbrot which is the Jewish version of these cookies. From this book you can learn to bake Biscotti that is just a tasty, or even more, as those sold at your favorite coffee shop. One particularly interesting recipe is "Mincemeat Walnut Biscotti". I know that a lot of you don’t care much for Mincemeat, I’m not sure where I stand on it, and not sure where I would find Mincemeat, but when I do I will make it and let you know what I think. 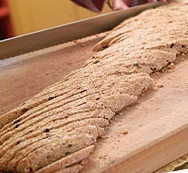 There is a variety of recipes from traditional to unique versions; even one called “No-Guilt Biscotti”, that incorporates, rolled oats, whole wheat and honey. These are very healthily if you, “must have a cookie” these should do nicely. I can't wait to try it; it will give me an excuse to eat more biscotti. This book does not have any photos, images or illustrations, so if you like your cookbook filled with color, this book might not cut if for you. It does include some information on what biscotti is and taste-a-likes versions from other nationalities as well as some good tips on making and baking this delectable delight. Since the word biscotti is the generic Italian word for cookie, a number of other Italian cookie (biscotti) recipes are included in the collection. In all there is 35 recipes that we in the US think of as Biscotti, including a few savory ones, like, “Chili Corn Biscotti” and “Cornmeal Parmesan Biscotti”. The other 15 recipes include “Rusks”, “Mandelbrot”, and several Italian favorites. Nice little cook book for Biscotti lovers, and if you check EBay you might be able to pick one up for a couple of dollars. This book has one the most extensive recipe collection of all the books I have reviewed. Fifty in all. But, if you were looking for more than a recipe collection you won’t find it this cook book. No tips or tricks, no discussion of the process for making biscotti and no pictures or illustrations. If you’re not looking for help with baking Biscotti, because you have already bake it a dozen or more time, then this could be a good book for. With 50 plus recipes which include some I have not heard of before, spiced cherry, pumpkin pie and a Christmas biscotti that use candied cherries. There are quite a few, more traditional recipes so if you are looking to dunk in VinSanto you won’t be disappointed.